A Rocky Top Teacher: Poetry a la carte! So poems are on my mind this week which means.....I am blogging about poetry today! Once upon a time...I LOVED poetry. Then, high school AP English happened and, as much as I LOVED me some high school English, it killed my love for poetry. I got so stressed out over deciding what the author really meant and what the multiple meanings for each verse were suppose to represent. It just wasn't fun. So, I crinkled my nose for a few years when the word poetry was mentioned. Then, I was sitting in a methods course during college and a professor relit my poetry fire and inspired me to use it with my future kiddos as much as possible. So, five years later...here I am. I use poetry every week. I use it to strengthen visualization, reinforce weekly strategies, highlight phonics patterns, build stronger fluency skills, and expose students to as many different forms of text as possible. Here is how it works. I give the students a poem on Monday along with a poetry menu. There are many different versions out there. 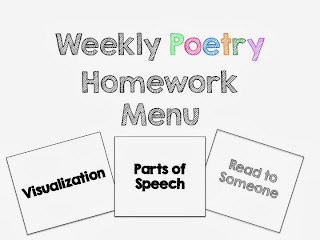 I needed one that worked for my kiddos so I created a homework menu that is focuses on skills that will challenge and excite them. The students have all week to complete six of the menu options offered to them. On Friday, we have our poetry reading time during morning meeting and then the students turn in their menus. It's simple, quick, and meaningful. Click here to grab the freebie. How do you use poetry in your classroom?